or my bathroom actually. 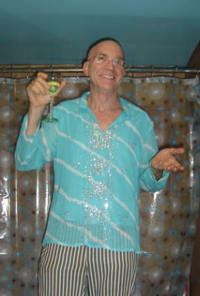 Andre came over for dinner Friday night and wore the most fabulous turquoise shirt. It matched my bathroom, so I took a pictures. G and I had nice conversation and heard about many of his adventures and syncronicities. It's always fun to hear how someone's life turns out to be a dream come true.